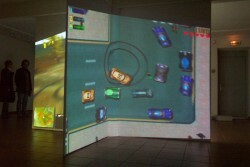 Untitled (Street Legal) takes the form of a multi-projection installation on four screens. 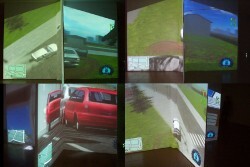 The projected films were created during gaming sessions on the racecar video game “Street Legal.” The source code was hacked, and the cars evolve in the environment by turning on themselves in an uninterrupted fashion. Traffic jams are created, collisions, the car flies off, etc. Even the camera no longer seems to know which angle to use in order to capture the situation. The spectator, in the position of an observer, cannot interact with the work; we can only speculate about the trajectory that the car will take, which only the other elements programmed inside the game can come and perturb by colliding with it. All these elements—the car that constantly whirls about, the spiral tracks left by the rubber on the pavement and the repetitive sounds of the screeching of tires—give the game a whole other dimension, poetic, hypnotic. The artists approach the code as a material for creation, a sort of active paint allowing them to generate works where all the behaviors internal to the materials work together, confront each other in order to evolve together. The spectator is freed of our role as a player enclosed in the logic of winner/loser, inherent to video games. He discovers new possibilities for experimentation with the medium. 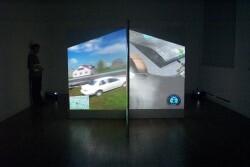 JODI thus critiques the attitude of the typical user evolving in a closed system without exploring either its limits or the possibilities that going beyond them would open up—a critique that the collective applies more generally to political and social issues brought about by a consumer society and by advertising and institutional communications. Established in 1995 and set up in the Netherlands, JODI is a collective of two artists, the Dutch Joan Heemskerk (1968-) and the Belgian Dirk Paesmans (1965-). Pioneers of online art, they explore the habits and behaviors of humans when confronted with a computer, in particular when it malfunctions because of its handling or because the computer code was hacked. 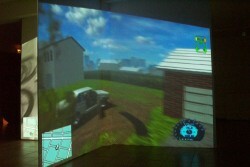 The works, making use of the aesthetic of the computer crash, offer a visual and structural critique of digital culture and evoke the absence of protection from technology.